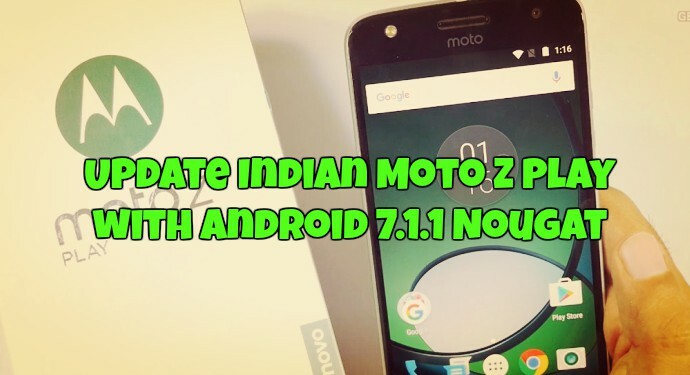 Here in this guide you can download Android 7.1.1 Nougat for Indian Moto Z Play and install this Official Nougat update on your beloved Moto Z Play Android phone. Yes, the official nougat update is finally released for the Indian Moto Z play users. You can find details about this new update on the Motorola website. To update Indian Moto Z play all you have to download the Nougat OTA update on your phone and after that, you can easily it on your phone. To check the OTA update on your phone go to Settings -> About Phone -> System Updates. Here you can see the new nougat OTA update for your phone. if you can’t see the update, then here are the full instruction which you can use on your device and Update Indian Moto Z Play with Android 7.1.1 Nougat. The new update comes with a few minor UI changes like adding a settings icon to the notification panel, app shortcuts to the launcher, and some changes in the stock icons of the apps. As we mentioned above that you can also install this update on your phone manually and yes no need to root your devices to apply this Nougat OTA update on your phone. So let’s get started and see how to Update Indian Moto Z Play Android phone. All you have to download one zip file and flash the same on your phone. This one is the official nougat update direct from the Motorola. Read all the steps very carefully and follow all of them one by one on your phone. The first and most important step is to take the full backup of your phone. Take the backup of all your files, image, videos etc and save it in some safe place. Install the ADB and Fastboot drivers on your windows PC. This will create an ADB folder on your Windows C drive (C:/ADB). Without these drivers, you can run the fastboot commands on your windows PC. Make sure that your phone has at least 50-60% charged. Below is the Android 7.1.1 Nougat zip file for the Moto Z Play. Save it on your windows Desktop. 1. Download the zip file from the above-mentioned link and save it on your phone’s internal memory. 2. Now the file is saved on the phone. So time to boot the phone in recovery mode. To do this Power off your device. Now press and hold the Power and Volume Down buttons together for a few seconds. Now you see the Bootloader screen on the phone. Use the volume buttons to select the recovery option and Power button to select to boot in recovery mode. 3. Once you are in the recovery mode. Select the apply update from sdcard option. 4. Now locate the OTA zip file that you saved on your phone and then select it. 5. Now the installation process will start on your phone and this will take some time. Once completed your phone will boot in the latest Android 7.1.1 Nougat update. If the above method will not work for you then you can use this method to install the update. 1. Install the ADB drivers from the Download section. And you can see the ADB folder on your windows C drive. 2. Open the ADB folder and paste the Nougat zip file in the ADB folder. 3. Rename the zip file to update.zip. 4. Enable USB debugging on your phone. If you don’t know how to do it, you can refer to our guide. 5. In the ADB folder type cmd in the address bar and hit enter to open a command prompt window on the desktop. 6. 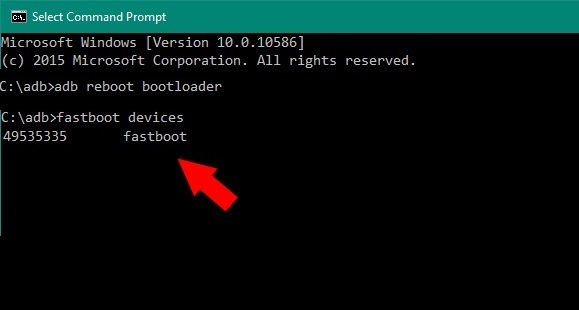 Turn off your phone and boot into recovery mode as explained in step 2 of the above method. 7. Select the option Apply update from ADB and then connect your phone to the PC via a USB cable. And run the following command to check the connection of your phone. You should see the serial number for your device which means it is connected. 8. Now run this command to flash the update on your phone. 9. Now the installation process is started on your phone. Once it’s complete your phone will reboot automatically. So with this way you can easily update your Moto Z play with the Android 7.1.1 Nougat update. If you have any question or facing some problem during the process, then leave the comment below.